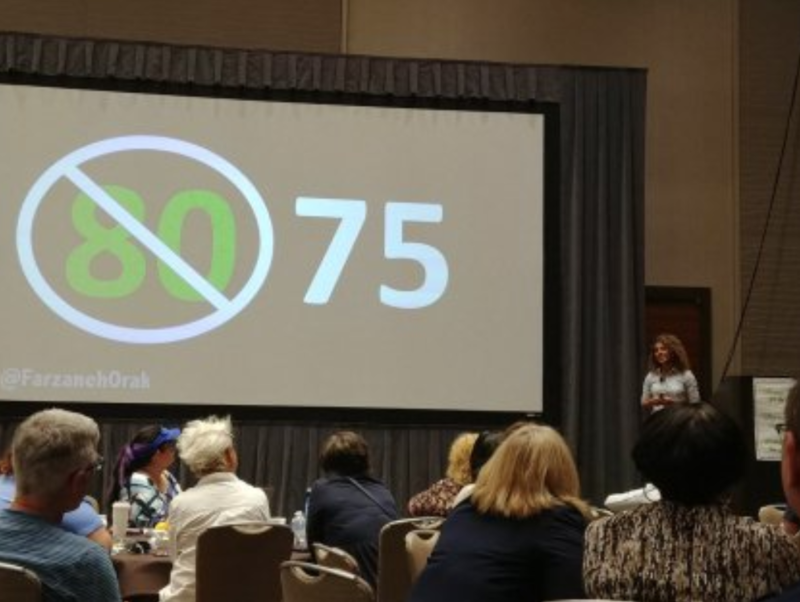 The Women in Agile Conference at Agile2018 was sold out this year at 230 registrants and a waitlist dozens long. Last year we had over a hundred participants, and the year before that around 80. 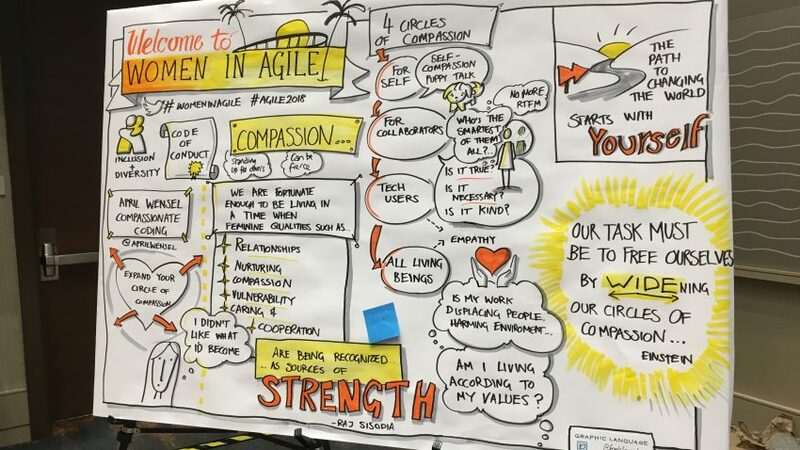 Love all the support for the Women in Agile community. Natalie Warnert kicked us off with a warm welcome, an overview of the logistics of the event and really spoke to the reasons why the work we’re doing is so important, and that everyone there was playing a role. She turned it over to Paul Hammond and Becky Hartman, who gave a brief update to the Code of Conduct and asked for participation in a voting exercise on the frequency of various issues that one may have experienced and/or witnessed. 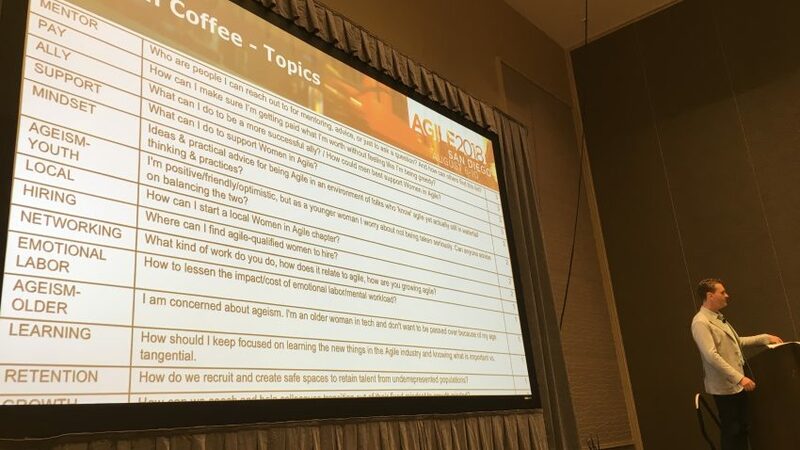 This information was used in the Agile Tonight segment later that week, where there was be a session on diversity and inclusion and ideas for how to be more proactive to help elevate the learning for everyone. Psychological safety was also a topic. Then it was time to welcome April Wensel, founder of Compassionate Coding to deliver our keynote. Her keynote was titled Expanding Your Circle of Compassion for Greater Impact. The wonderful Tamsen Mitchell created the below graphic. 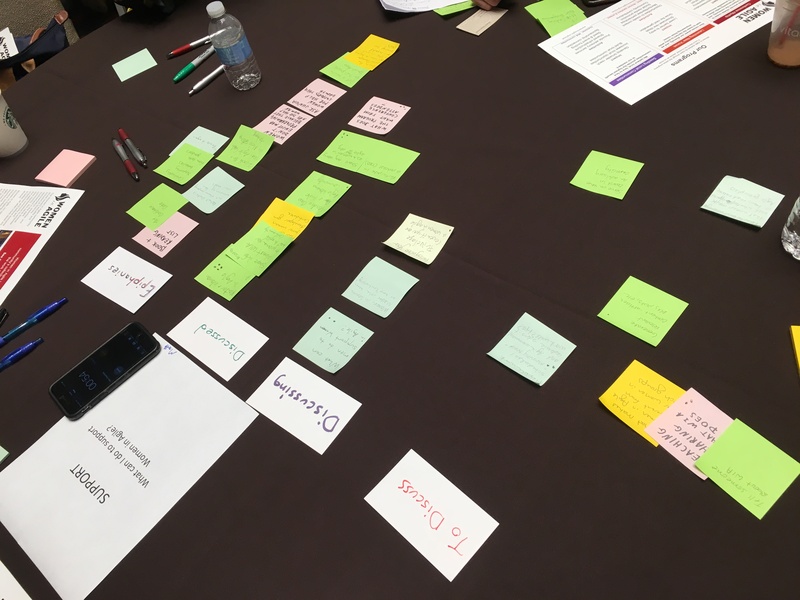 After the break, it was time to break into our groups for facilitated Lean Coffee topics. 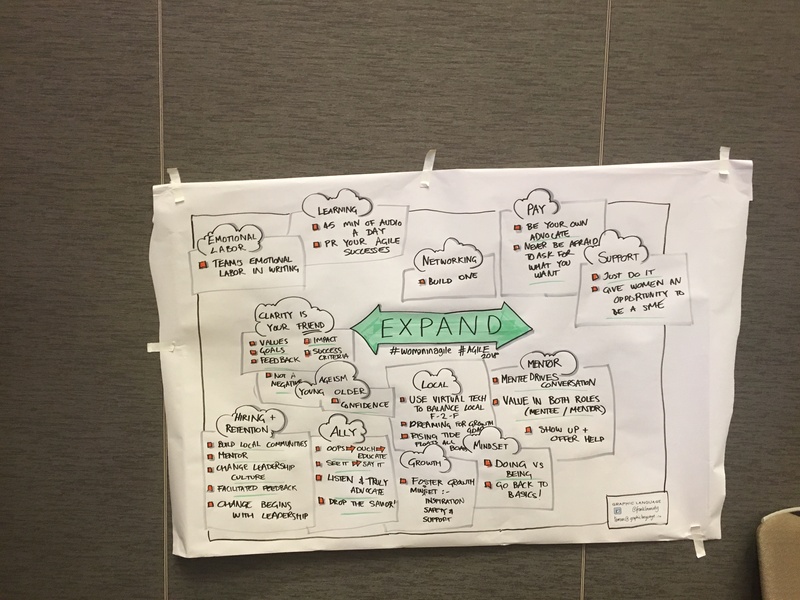 We had a lively discussion about the topics and were able to get a lot of great ideas and helpful content when the tables shared their biggest learnings. After the final break, it was time for the Launching New Voices program. 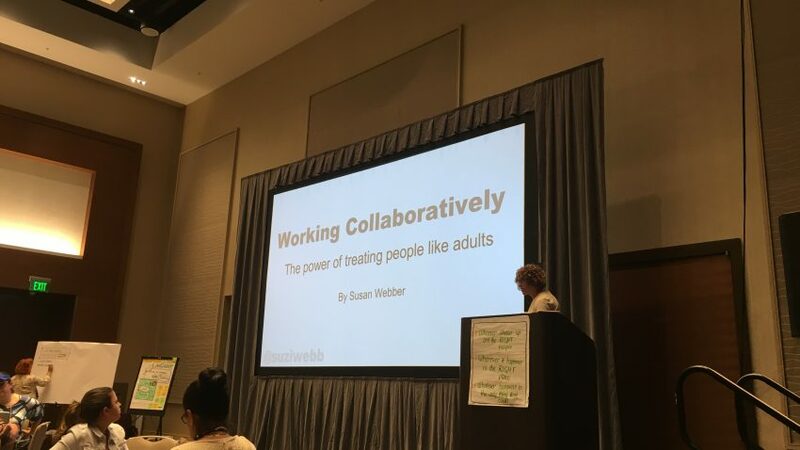 Suzi Webber spoke on Working Collaboratively – the power for treating people like adults, where she shared a story of how she and her son worked through conflict and the techniques that she learned and applied. Suzi’s recap of her experience can be found here. Then Farzenah Orak shared she very moving and motivating story about how she was able to overcome setbacks and reach her goals. Impressive all-around! Her recap of the experience can be found here. 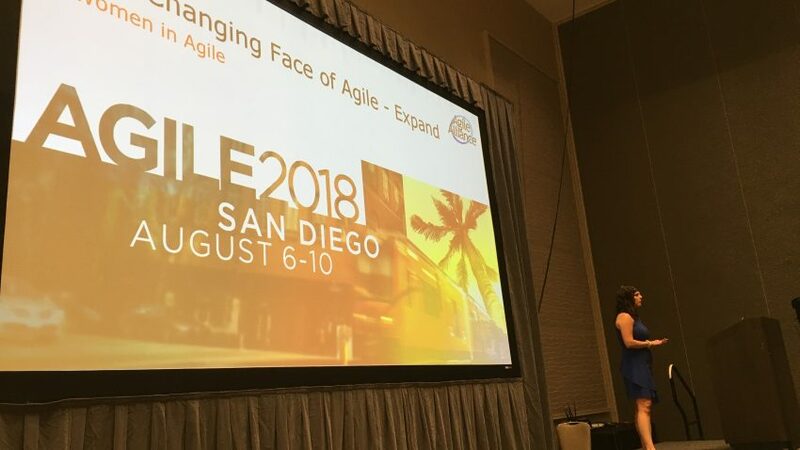 It was a wonderful way to kick off the Agile2018 conference and looking forward to continued success. 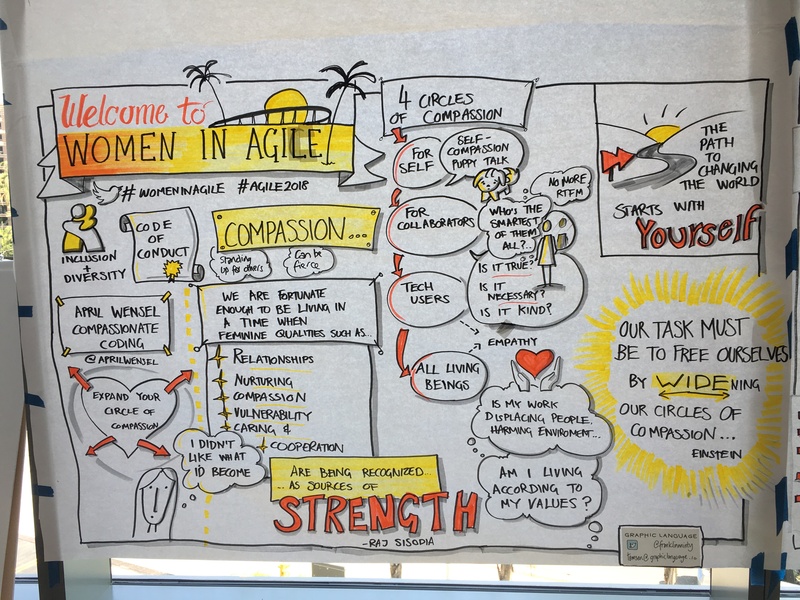 If you’re interested in helping Women in Agile, please reach out to info@womeninagile.org. I’m an introvert. At cocktail parties, I’m the one over on the couch by myself talking to the dog. I pin the needle WAY over on the introvert side. Giving presentations is not something I usually feel comfortable doing. And I’m never the person that people recognize at conferences and want to talk to. 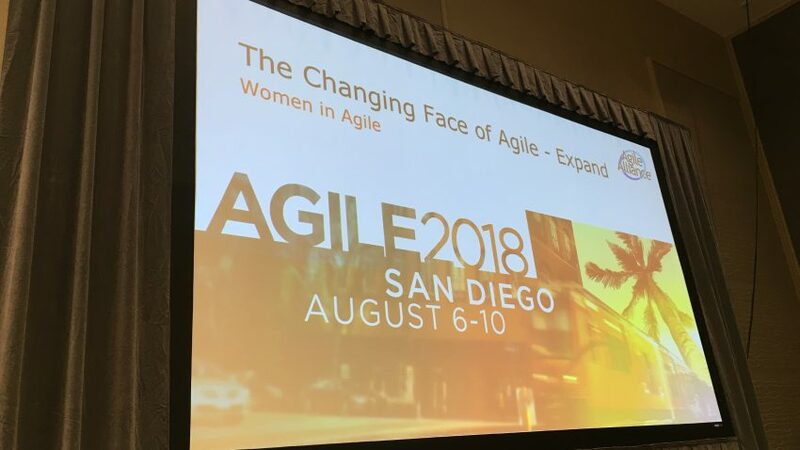 Agile 2018 was different, and it was all because of Women in Agile. 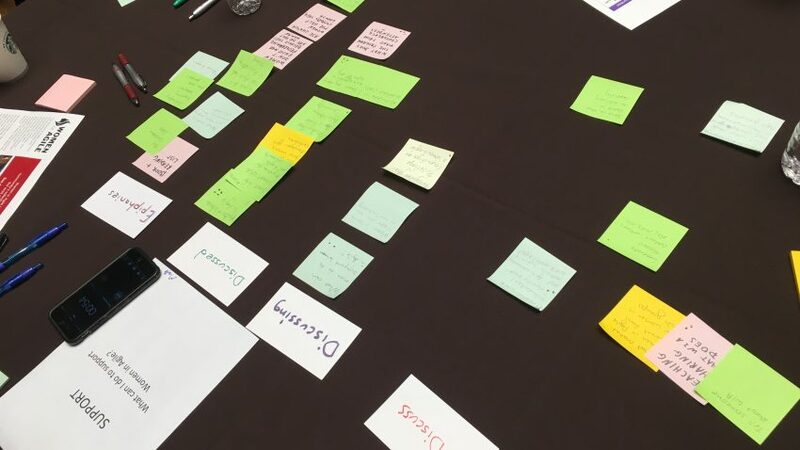 When I submitted a proposal for Launching New Voices, I had a vague idea floating around in my head, and I thought that being given a deadline would help me clarify my thinking. I thought it might also give me the opportunity to develop relationships with some kindred spirits, something I felt was lacking in my life. When I received the email saying my proposal had been accepted, I was excited, but more than a little frightened. Would I be able to create a good presentation? What if I freeze in front of the audience? What if they don’t like it? What if they don’t like me? Not the most powerful self-talk when you’re about to embark on something that requires you to take a leap. But I was in it, and I wasn’t going to give up before I even got started. At our first conversation, my mentor Llewellyn Falco jumped right in and said: “Ok, give me the presentation”. He wasn’t kidding. The first run through was a rambling mess. But approximately 30 iterations and many hours later, I had a presentation. And not one with a few slides with bullets. An ACTUAL presentation that I felt had a strong focus and would engage the audience. Llewellyn was a taskmaster, giving me homework, asking me to develop a story, then helping me to distill the most important idea. He encouraged me to think about how to build a relationship with the audience and help them to make a connection to their own lives. It required me to be vulnerable in a way that was uncomfortable but was the key to being able to present something that was authentic and engaging. I could not have done it without him pushing me to stretch and giving me not only the practical tips he had from speaking, but also the encouragement to keep working. But one of the most important things was that I wasn’t doing it alone. I had someone on my side. When it came time to present, I expected that I would get up on stage, give my talk, and that would be the end of it. I thought I’d be relieved it was over. I immediately wanted to do it again! Maybe it was just adrenaline, but three weeks later I’m still energized by the experience. I still want to pursue other opportunities to present the talk, and I still want to expand it. Every couple of days I jot down an idea for a new viewpoint or concept to add to the presentation. It never occurred to me that people might recognize me later on and go out of their way to mention how the presentation resonated with them. It felt like every meal, every elevator ride, every session, someone would tell me that they had a similar situation, and appreciated my perspective. I confess that I spent the rest of the week trying to recapture the positive energy and camaraderie that was present that afternoon and during the conversations that were sparked by the event. 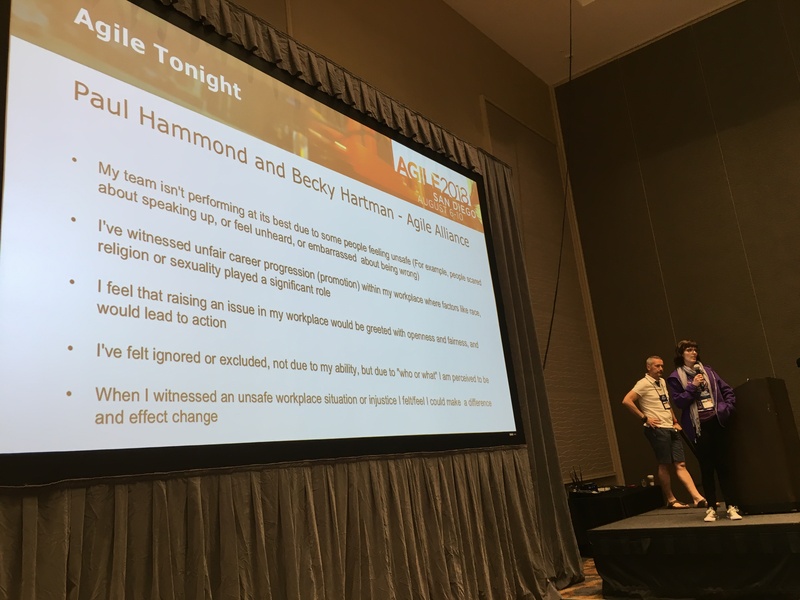 It allowed me to have a much richer experience at Agile 2018, and make genuine connections with people that I wouldn’t otherwise have been able to create. Was it a ton of work? Yes. Would I do it again? Absolutely. When you’re trying to juggle a family and a job, it’s so all-encompassing that it’s hard to make the effort to do something that forces you to paint outside the lines. Launching New Voices did just that for me. And I’m a lot more colorful for it. Check out a video of Suzi’s talk here. 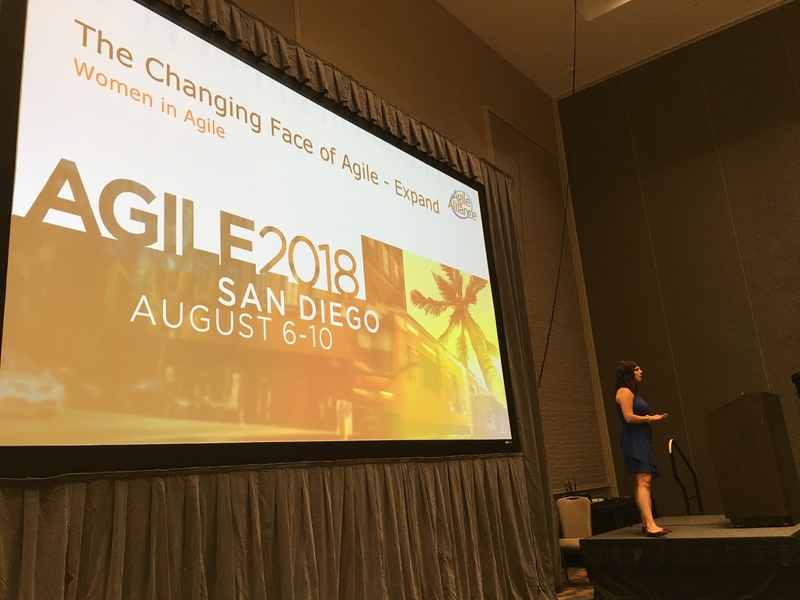 Speaking at Women in Agile 2018 was one of the neatest things happened to me. 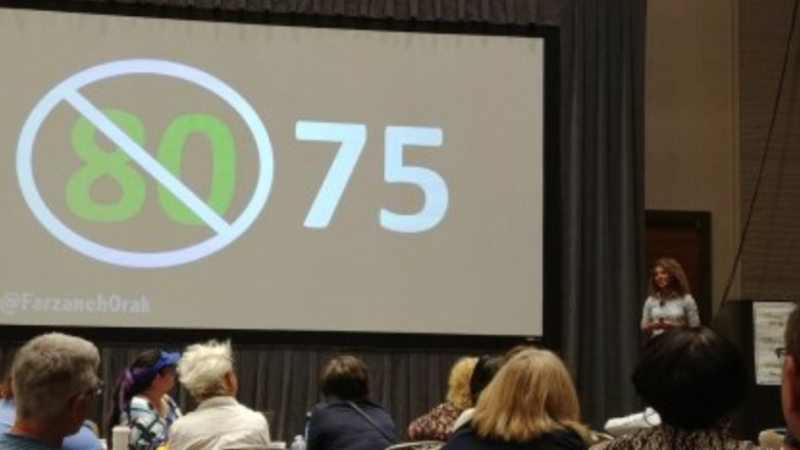 It was not only a challenge for me to start public speaking front of a large crowd at an actual conference but also very interesting to meet a community who were there for your success – people who flew miles to be present and show their support. They were there to empower women in technology and share their stories, and whoever I met made me feel welcome and happy to accept this challenge. Two months before the conference day, I met with the organizers and the rest of the speakers. After pairing mentors and mentees, speakers from last year introduced themselves and shared their experience with us. At the end of the conference call, they asked us to make sure schedule the next meeting with our mentors. My mentor was Cheryl M Hammond. Right after the meeting, she and I had about a two-hour-long phone call. Cheryl was so curious about what I planned to talk about, and I was so curious to know her opinion. After she listened to me, she gave me her feedback, and we planned our next meeting. During the two following months, we met at least once a week. Every week, she would give me the constructive feedback, and I did my best to apply them in my talk. Working with her and knowing her was a blessing. Finally, the conference day came I was very excited, but at the same time nervous. Cheryl and I planned to meet in person one day before the conference and on the conference day. A few of my friends decided to come to support me, and having Cheryl and friends around made me feel supported. Everyone I met made me feel welcome. I truly felt this crowd wanted me to succeed and that helped me to calm down and be proud. The conference started with introducing the organizers and then the keynote. 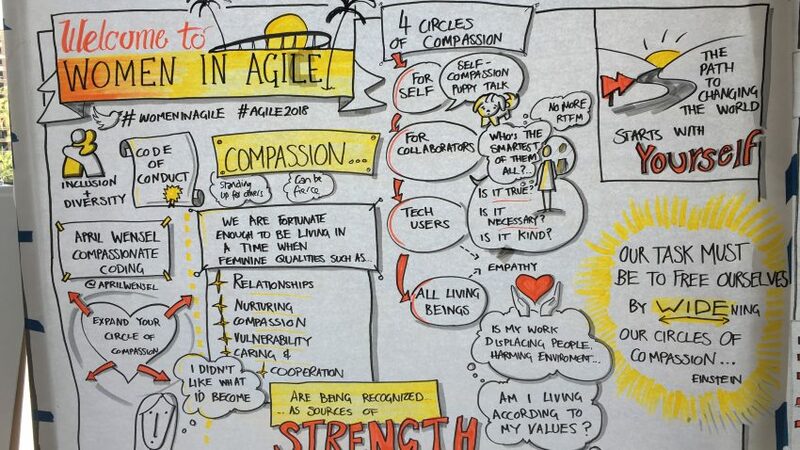 The keynote was by April Wensel, founder of Compassionate Coding. Her keynote was about Expanding Your Circle of Compassion for Greater Impact. It was a very impactful talk she starts with encouraging women to be themselves and that they should not change themselves in order to be a fit within the tech industry. She shared her life journey when she was unhappy, despite being successful at her job because she was trying to change herself in order to be accepted as a smart and good software engineer. And then, she continues with a very insightful quote by Raj Sisodia “We’re fortunate enough to be living in a time when feminine qualities such as Relationships, Nurturing, compassion, vulnerability, caring, and cooperation are finally being recognized, not as signs of weakness but as sources of incredible strength.” Which basically helped her to accept and appreciate what she brought to the table as a female. She finished the keynote by encouraging everyone to empower compassion by accepting who we are and respecting others as who they are. 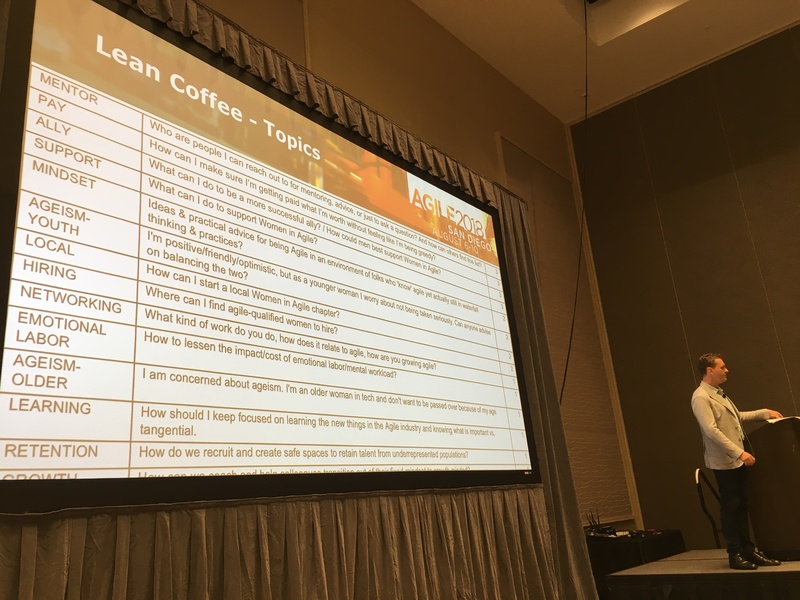 The second session of the conference was lean coffee which was focused on the obstacles for women in the technology field. The crowd split into groups to discuss stereotypes and issues that many women deal with daily at their workplace or even society. It felt very relieving to see such a community and how passionate they are. It made me see a much brighter future for our technology field culture. 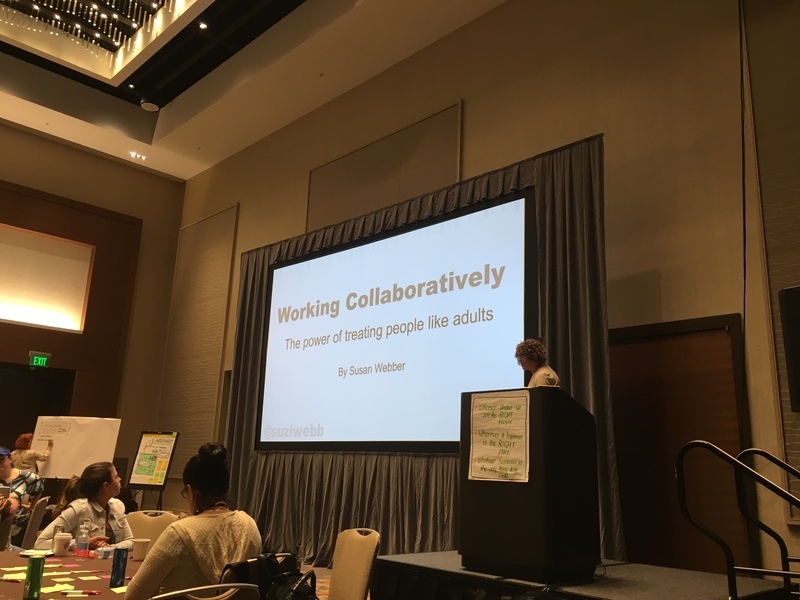 The New Voices’ session started with a talk from Susan Webber. Her talk was very impactful where she spoke of applying her experiences working in the group at work to her son, which helped her step out of mother and son role. Instead of demanding, she considered her son emotions and thoughts, they were able to share in the decision-making process instead of her making decision for him. 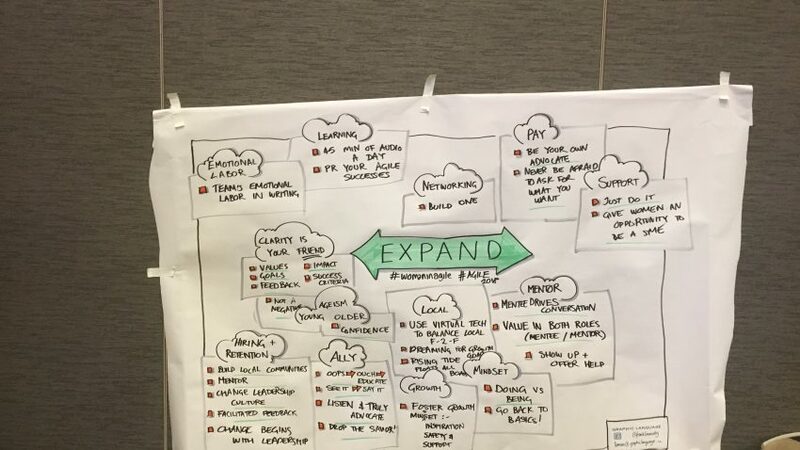 I talk about my journey where I started as a girl who couldn’t find an address using GPS map to a woman who draws a map of complex system which it goes on the first page of internal application and gets presented to so many people (stakeholders, leaders, new employees and etc.…) in a few years. I talk about finding my passion for computer science but having so many obstacles along the way. I talk about when I didn’t let failure defeat me, and I promised myself to keep moving forward and pursue my passion. How I applied for graduate school (for the second time), and I get admitted, and two years later I graduated as an honor student from a graduate program in computer science. I talked about how my passion for programming helped me to use all my power and resources around me to keep improving my technical skill and contribute to the community. Growing in my field was my dream so I put all of myself and heart to it, study for hours after work, going to different user groups to know the community and volunteering in different events to give back to the community. Sharing, always share what you learned with other people there are people like you a few years ago who need your help and information- giving back to the community. 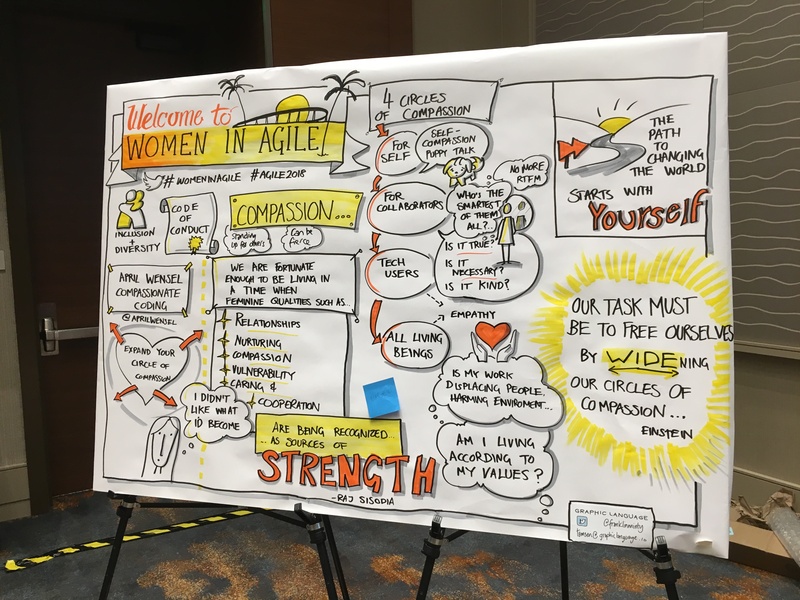 Women in Agile was a great experience for me. I learned about this community who are there to support and accept women in tech. These people truly believe in the Raj Sisodia quote I mentioned above, and they want you to be successful because they have experienced many obstacles during their career and now they want to use their power and experience to make a better future for the current and next generation. 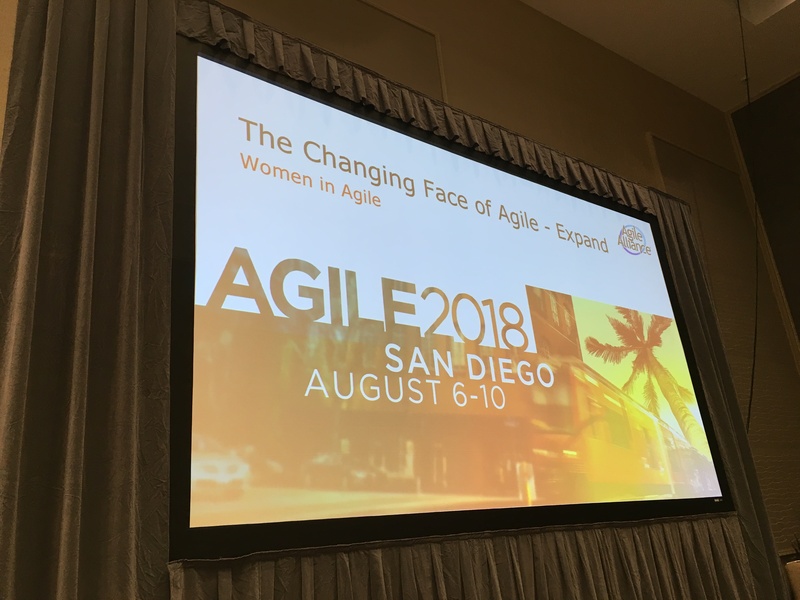 And finally, I felt amazing by challenging myself, learning more and gaining new experiences as a new voice in Women in Agile 2018. Check out a video of Faranzeh’s talk here. In this podcast, James Gifford gives his thoughts on the event and shares the lightning talk portion of the event. 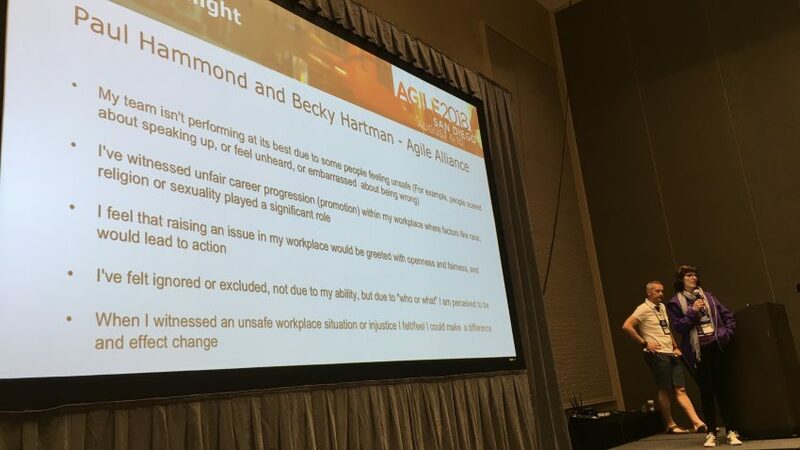 In this podcast, Natalie sits down with Ryan Ripley to discuss all things #WomenInAgile.